Daniel 8:3, 20 … behold, there stood before the river a ram which had two horns: and the two horns were high; but one was higher than the other, and the higher came up last. 20 The ram which you saw having two horns are the kings of Media and Persia. The two horns in this verse describes the fact that the kingdom of the Medes initially was strongest and ruled a part of the world contemporaneously with Babylon, but later the Persian kingdom, led by Cyrus, overthrew the Medes. This illustration corresponds to the bear with 3 ribs in his mouth, one of the four beasts, in Daniel chapter 7. The two horns of the ram with the “last” one coming up higher than the other is a very similar description to the lopsided bear, which “raised itself up on one side,” in Daniel 7. This confirms the idea that both of these animals, the bear and the ram, represent the kingdom of Medo-Persia, which also was depicted by the silver chest and arms in the image of Daniel chapter 2. 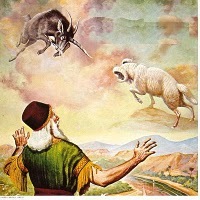 Daniel 8:5-7 And as I was considering, behold, an he goat came from the west on the face of the whole earth, and touched not the ground: and the goat had a notable horn between his eyes. 6 And he came to the ram that had two horns, which I had seen standing before the river, and ran unto him in the fury of his power. 7 And I saw him come close unto the ram, and he was moved with choler against him, and smote the ram, and brake his two horns: and there was no power in the ram to stand before him, but he cast him down to the ground, and stamped upon him: and there was none that could deliver the ram out of his hand. The kingdom depicted here is Greece that rapidly conquered Medo-Persia (so rapid that the illustration is that the goat did not even touch the ground) and endured from 331 B.C. to 168 B.C. when Greece was conquered by Rome. This great horn was the first king of Greece, not the first monarch himself, but the first kingdom, the united kingdom of Greece, which was led by the famous Alexander the great and his brother Aridæus and two young sons, Alexander and Hercules. Alexander was a very strong general but died at a young age of 33, on June 11, 323 B.C.. It is said to have been caused by poisoning, or heavy drinking, but it is not clear. Daniel 8:21,22 And the rough goat is the king of Grecia: and the great horn that is between his eyes is the first king. 22 Now that being broken, whereas four stood up for it, four kingdoms shall stand up out of the nation, but not in his power. Alexander’s kingdom (after much infighting) was eventually broken and divided among “four notable” horns or kingdoms into which Greece divided, and which ruled by their governors. These kingdoms are also portrayed by the four heads of the leopard in Daniel chapter 7. The meaning of the word ‘king’ in the text is of a kingdom, which is represented by its king. Daniel 8:9-12 And out of one of them came forth a little horn, which waxed exceeding great, toward the south, and toward the east, and toward the pleasant land. 10 And it waxed great, even to the host of heaven; and it cast down some of the host and of the stars to the ground, and stamped upon them. 11 Yea, he magnified himself even to the prince of the host, and by him the daily sacrifice was taken away, and the place of his sanctuary was cast down. 12 And an host was given him against the daily sacrifice by reason of transgression, and it cast down the truth to the ground; and it practised, and prospered. Antiochus Epiphanes IV came out of one of the regions Greece broke up into, the Seleucid Empire. He outlawed the sanctuary services in the Jerusalem Temple in 171 B.C and as some have claimed 2300 days later on December 25, 165 B.C. the Temple was cleansed and its services were restored. This is supposedly the fulfillment of this prophecy. But there are several problems with this interpretation. One is that the meaning of the symbolism of the horns in the book of Daniel and the book of Revelation (the Apocalypse) is of a kingdom or a dynasty of kings, not an individual king himself. The ‘horn’ in verse 21 was the ‘first king’, which was Alexander, but the king is used as representative of the kingdom itself. So the words ‘first king’ can be best understood as representing the dynasty of kings who led the united Greece, and when that horn was broken the kingdom was broken and then divided into four kingdoms. Daniel 8:13,14 Then I heard one saint speaking, and another saint said unto that certain saint which spake, How long shall be the vision concerning the daily sacrifice, and the transgression of desolation, to give both the sanctuary and the host to be trodden under foot? 14 And he said unto me, Unto two thousand and three hundred days; then shall the sanctuary be cleansed. Rome had conquered Greece by the year 168 B.C. (the eighth year of Antiochus Epiphanes IV). Beginning with pagan Rome, and then later, after Rome came under the power of the Latin Church, lead by the Anti-Christ Papacy, this new power ‘treads down’ the physical and then spiritual Israel, the true Church, for a period of 2300 years. By taking the start date for that period as 168 B.C., when Rome conquered Greece, you get 2133 A.D., but in prophecy usually years are counted off by lunar years of 360 days each. Adjusting for that results in an end date of 2100 A.D. Nevertheless it not clear when the ‘2300 day’ period begins. Newton suggested it could have been from 70 A.D. when the Temple was destroyed or when the Temple to Jupiter Olympius (the abomination of desolations) was established in 135 A.D. or from the end of the Jewish wars, when the Romans exiled all Jews out of their country. If it was 70 A.D., then by adding 2300 years, corrected for 360-day years, that takes you to 2337 A.D. and the other start dates make it still further out. The far greatest significance of this prophecy is in respect to what arises after Greece. Daniel 8:23, 24 And in the latter time of their kingdom [referring to the 4 kingdoms of Greece], when the transgressors are come to the full, a king of fierce countenance, and understanding dark sentences, shall stand up. 24 And his power shall be mighty, but not by his own power: and he shall destroy wonderfully, and shall prosper, and practise, and shall destroy the mighty and the holy people. Rome invaded Greece and in so doing invaded the land of Israel, or Palestine, as it was then called. 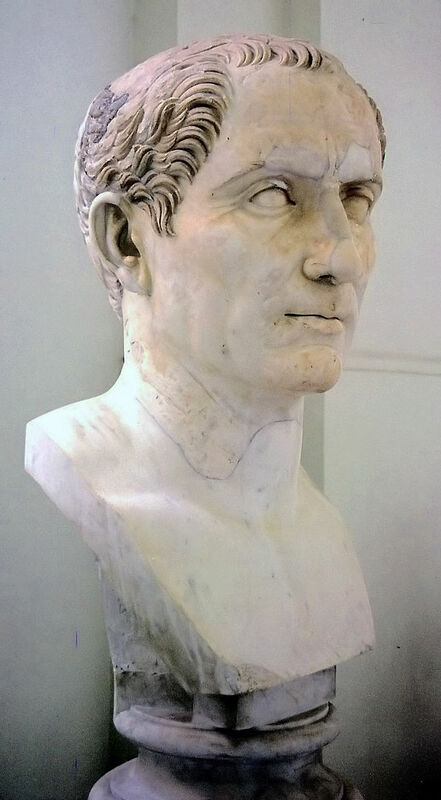 The Roman general Pompey conquered it in 63 B.C. but Julius Caesar conquered Alexandria c. 47 B.C. and defeated Pompey in 45 B.C. Under general Titus, in the reign of Vespasian, the second Temple was destroyed in 70 A.D. during the First Jewish Revolt. Then followed a diaspora of Jews throughout the world under Roman rule that ensued. The pagan Roman Empire endured until 476 A.D.. Some claim that it was Julius Caesar depicted here in Daniel 8:23-25, a king of fierce countenance. Again, this has the same problem. As already mentioned the ‘kings’ are kingdoms, not individual persons. And the prophecy here alludes to a king who has ‘understanding‘ of ‘dark sentences‘, but ‘not by his own power.‘ This alludes to spiritually dark forces, to satanic powers. And there is no doubt that the pagan Roman conquerers were inspired by Satan, but there is more to this and it has a connection with God’s people, who are the true believers in Jesus Christ. Daniel 7:8, 25 … in this horn were eyes like the eyes of man, and a mouth speaking great things. 25 And he shall speak great words against the most High, and shall wear out the saints of the most High. This horn is the world ruler, not an individual, but the line of kings, which rises out of the collapse of the pagan Roman Empire to claim a new empire, the kingdom of papal Rome. See Daniel 2. He (that is, the popes) speaks blasphemy against God and tries to destroy the holy people, the true Church of God! Pagan Rome did this but the Papacy, under the Church of Rome, for a much longer period, suppressed and tried to exterminate God’s people. This Anti-Christ magnifies himself as we know Satan does. He stands up against the Lord, the Prince of princes, but God has promised that he shall be broken and eventually destroyed. This kingdom uses/used ‘peace’ to destroy. Certainly that was not the message from pagan Rome, but it is from papal Rome. They claim to represent Jesus Christ, the Prince of peace. The Roman Catholic Church claims the pope to be the vicar of Christ—His representative on Earth, or His replacement. If he were truly of Christ why all the centuries of slaughter of the innocents? The Papacy (Latin Romanism) rose to power after the fall of pagan Rome (476 A.D.), and endured for many centuries until the great Reformation. The Reformation commenced when Martin Luther published his theses against indulgences in 1517 A.D.. This led to war against the true Church by the false Church, the war between the temporal power of the popes and the spiritual power of the ‘paper pope’—the written word of God—translated into the languages of the common people, which the Roman Catholic Church/Empire tried to destroy, along with its translators. The power of papal Rome was eventually broken by the French Revolution (1793 A.D.) and with its invasion by Napoleon Bonaparte in 1870. He deported the pope (1872), seized the assets and land of the Papal States, and set up a Republic in Italy. Broken but not destroyed. In 1922 Benito Mussolini not wanting to take on the growing power of the Roman Catholic Church gave the Papacy 109 acres of land in Rome to create a new Papal State – the Vatican. Since then her power has again grown in the modern world. Daniel 8:26 And the vision of the evening and the morning which was told is true: wherefore shut you up the vision; for it shall be for many days. Daniel got his vision nearly 2500 years ago. Its complete fulfillment has not yet been realised. That can only happen on Christ’s return. Are you ready? Isaac Newton, Observations upon the Prophecies of Daniel, and the Apocalypse of St. John, Chapter I, p. 4, produced by Greg Alethoup, Robert Shimmin, Keith Edkins and the Online Distributed Proofreading Team. Release Date: October 15, 2005 [EBook #16878] under the terms of the Project Gutenberg License included with this eBook or online. Isaac Newton, Observations upon the Prophecies of Daniel, and the Apocalypse of St. John, Chapter IX, p. 28. This entry was posted in Bible prophecy, The Papacy, The Reformation and tagged Alexander the great, Anti-Christ, Antiochus Epiphanes, Daniel, Daniel 8, Daniel 8 vision, Daniel chapter, Gaius Julius Caesar, Greece, Isaac Newton, Jerusalem Temple, Julius Caesar, Latin Roman Church, little horn, Medo-Persia, Napoleon Bonaparte, Roman Catholic Church, Rome, The Church of Rome, The Roman Catholic Church, Vatican. Bookmark the permalink.